At the 59 E 59 Theaters, a very funny throwback show is going on. 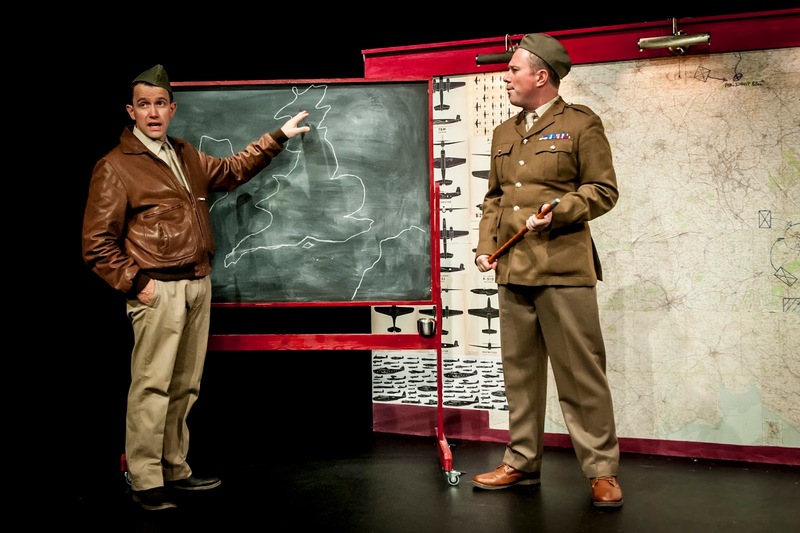 Instructions for American Servicemen in Britain, is a Music Hall style review that travels from humorous to hilarious. The piece plays off a 1942 US Army pamphlet of the same name that tried to explain the British to American servicemen. The audience is treated as a newly arrived squadron of Army Air Corps being briefed on the traditions of the British. The three man cast is excellent and also wrote the story: Dan March, James Millard and Matt Sheahan. They each play a main character and occasionally bring secondary characters to life. The play doesn’t have an overarching theme, but plays off a series of vignettes that flow as information to the new troops. All are funny, but some are hilarious. Matt Sheahan’s explanation of the British monetary system in the forties - the time of shillings, pence and farthings - is confusing, impenetrable and wildly funny. Dan March’s American Colonel is the epitome of a period of US bluster and self-importance. He is the ugly American that makes you laugh both with and at him. James Millard plays a perfect American guide, trying to bridge the differences, keep the peace and move the training along, without offending either side. Mr. Millard also indulges in the odd British tradition of dressing up in female drag and acting with broad farcical effect. It is dated and silly, but still oddly charming and humorous. The audience loved the show, despite a wide range of ages. The three man troupe engages in a lot of audience banter. To their credit, they are able to work both when the audience joins in, and when they have a bunch of stiffs sitting there. Instructions for American Servicemen in Britain is a slight and dated show, but somehow it works even better as a period piece. Today the jokes would be stereotypes and not funny, but here, taking the piss out of both sides, it is all obviously in good fun. Well, that was weird as hell! I went (to the Shed) and saw a show last night. It was called Norma Jean Baker of Troy. And starred one of my all-time favorites, Ben Whishaw and Renée Fleming, an Opera Star in the best sense with an amazing voice. It was a show, not a play. More a poem of dance and obsession. It reminded me of the movie Howl, where James Franco recites the poem, as Alan Ginsberg, and the poem plays out around him in action, occasional cartoon and history. Howl is great. Norman Jean Baker of Troy is not great. It has some great moments. Ben Whishaw is great as always. He has an intensity and voice and movement that is mesmerizing. It is used here to a hypnotic effect. Renée Fleming’s voice is similarly hypnotic and haunting. Her voice is pure energy, rising and falling like a third person in the room. Putting them together should yield something that is completely different, which NJBOT is. But it should also yield something inviting and urgent, which NJBOT is definitely not. Ben Whishaw recites the lines to a transcriber, Renée Fleming. He describes the fall of Troy substituting Norma Jean for Helen. But is a reflection, a simulacrum, a cloud of Norma Jean (the cloud analogy is used over and over and over again). One that Arthur of Sparta and New York (Arthur Miller, Marilyn Monroe’s 3rd husband), attempts to recover. Norma Jean is, according to this told rendition, is held by the gods – not in Egypt as in Euripides poem, but at the Chateau Marmont. NJBOT continues in this tale for ninety minutes. The story-teller brings in the story of Persephone as well. All of these women loved and hated and held for their beauty. 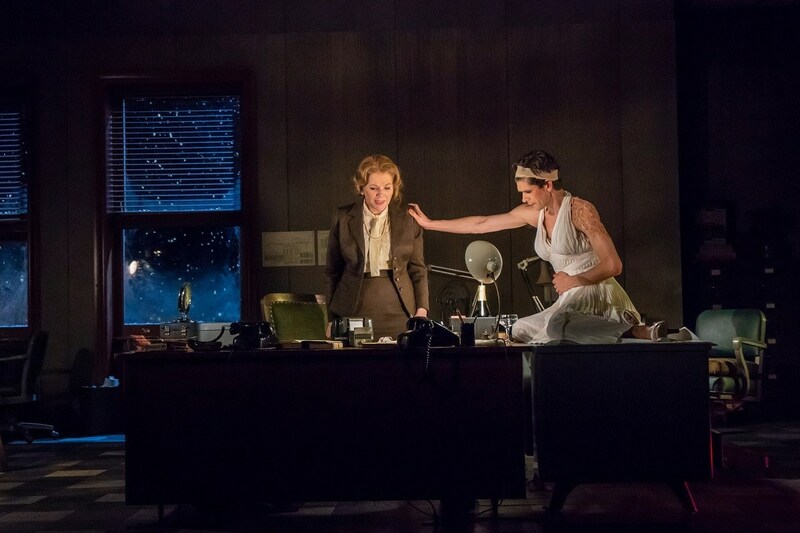 As the poem progresses, Whishaw is slowly, very slowly, transforming into Marilyn in her iconic seven-year itch white dress. And Renée moves from simply transcribing to telling the tale and transcribing and singing and helping with make-up. A shot probably from the second row. I sat in "D" and barely saw their faces. It ends, as it must, with Whishaw overdosing and going to sleep. How is it? Well, I loved it and hated it at the same time. Ben Whishaw and Renée Fleming are unimaginably good, because you simply cannot believe it could hold your attention, and it does. Ms. Fleming’s voice is like nothing I’ve ever heard, but I am not an Opera fan. And the same time, more than a few people walked out. As for The Shed, it is way too cavernous for this play. The props were human sized and yet so far from most of the people you knew who the pictures were only because you knmow it is Marilyn Monroe. They need to understand how to use the space. The shows at the Park Avenue Armory give me hope for the space. 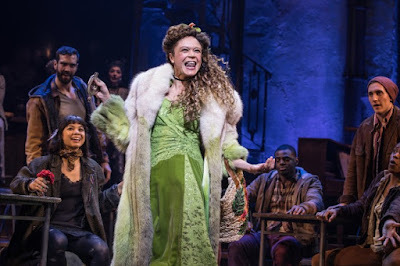 Hadestown takes the audience on a journey from New Orleans to Hell and back, weaving an entrancing spell all the way. It is almost impossible not to be swept along on the ride with Eurydice and Orpheus as they fall in love with spring, each other and life. 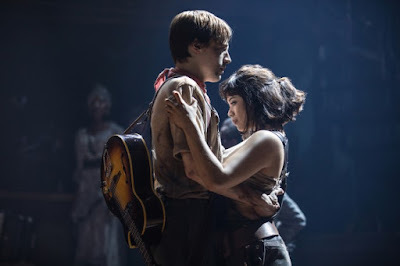 Eva Noblezada stars as Eurydice and Reeve Carney as Orpheus, the son of a muse and expert with the lyre and song. They meet as Persephone (Amber Gray, simply killing it) rises from Hell to herald Spring back into the world. 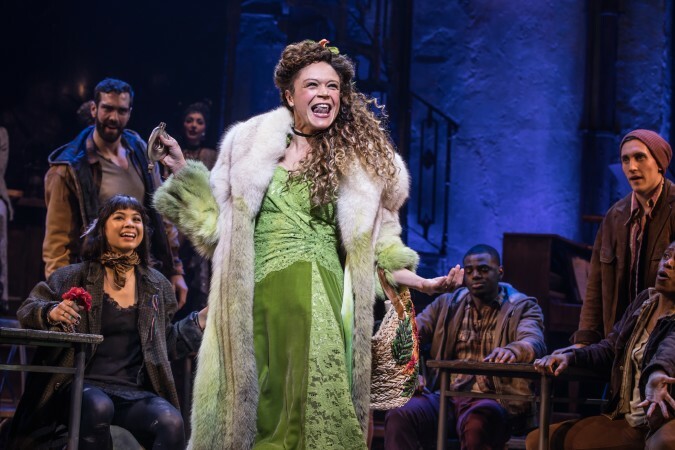 The celebratory mood is infectious and joy leaps from the talented cast. When Hades (Patrick Page) summons Persephone back to the underworld, darkness descends. And there, in the cold and dark, Eurydice struggles to survive. Orpheus is too busy writing a song to lure springtime back to notice Eurydice’s plight. And so, she makes a literal deal with the devil giving up freedom for food and warmth. Guiding us on this journey is André de Shields as Hermes. He moves smoothly, bringing the narrative a sultry and seductive voice. That Andre De Shields still commands the stage isn’t a surprise, but the ease of his performance and casual elegance is a pleasure to behold. No less entertaining, albeit harder working, are the spectacular Fates, the three women who entice and direct the actions of mere mortals. These singers, Jewelle Blackman, Yvette Gonzalez-Nacer and Kay Trinidad move with timing, energy and familiarity of a jazz trio (with an admitted nod to the Pointer Sisters). They are the voice of both doubt and hope. 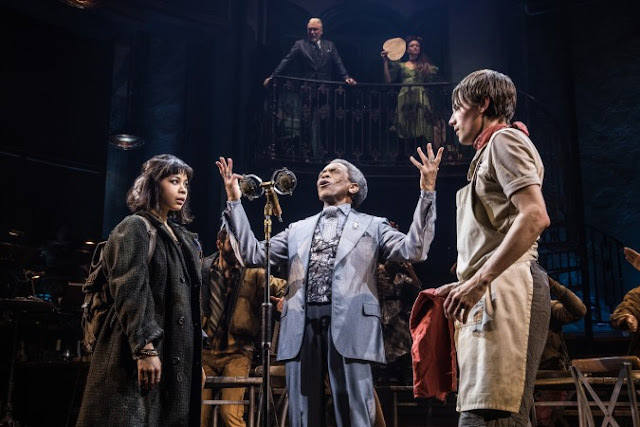 The early mood of Hadestown is light and breezy, but with the undercurrent of deeper forces. And when those deeper forces rise to the fore, bringing us to Hell, we are confronted with a different reality. Hades rules an underworld that embraces productivity and production, without worrying about an output. It is a terrifying and stark place. Hades and Orpheus are both energized by love to create a world to impress and honor their intended partners. But both lose sight of their partners’ desires in their drive to impress them. Both are so infatuated by their creation, Hades in the industrial behemoth and Orpheus in his song, that the original reason for creation is ignored. Recovering the affections of the women then becomes paramount. The voices and song are excellent. 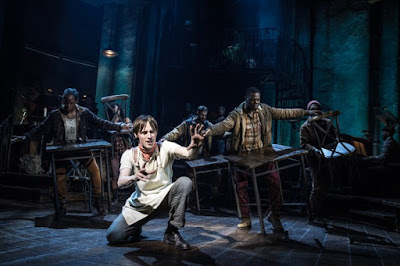 Mr. Carney’s first tentative steps are part of Orpheus finding his voice. Mr. Page’s amazing bass is all about Hades’ knowing his strength. Eurydice and Persephone’s joyful journeys move from revelry to tenderness in the opposite direction. Even the chorus of five players is exceptional both vocally and visually. Their expressiveness in dance and voice enhanced the show in great ways, and they move as the audience's surrogates. Rachel Hauck’s scenic design enhances emotions throughout the journey, but Orpheus’ descent into hell is particularly interesting, done with simple lighting effects. Director Rachel Chavkin has brought Anais Mitchell’s songs and book to life magically. Go see it now, while you can still get tickets. After is a gut punch that sneaks up on you. The play is set in an upscale house, typical of something you would see in Westchester or the Hamptons, smoothing blues and tasteful furniture. And it is populated by the nice mid-upper class semi-repressed white inhabitants you expect. The very normality is what lulls you into the expectation of a simple story with simple answers. Author Michael McKeever gives a straightforward, albeit not simple, story and then delivers the raw emotions that go with it. 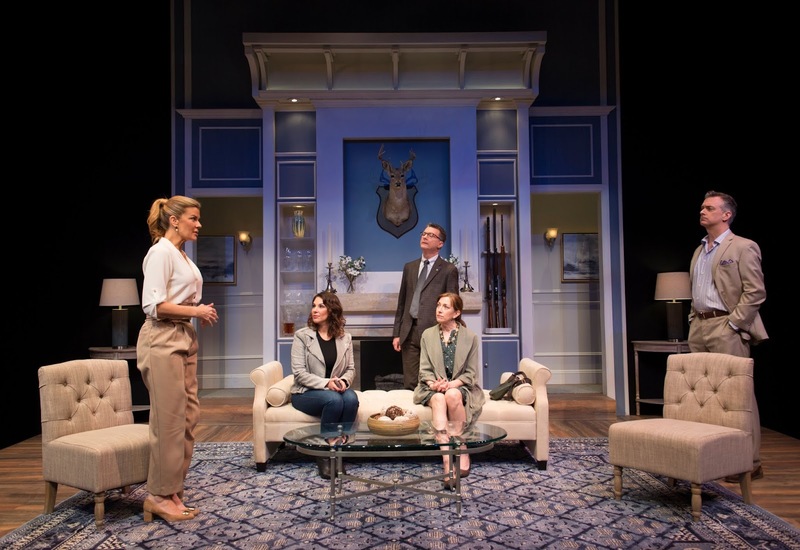 The central dynamic of After is the conflict between two sets of parents who are long acquaintances, but not friends. Connie and Alan Beckman (Denise Cormier and Bill Phillips) are visiting the home of Julia and Tate Campbell (Mia Matthews and Michael Frederic). The Beckman’s son was bullied by the Campbell’s son and they have been invited over to discuss the situation. Julia Campbell has also invited her sister who is an old friend of Connie’s. Sister Val (Jolie Curtsinger) comes to the discussion as a referee of sorts. What follows is a series of three scenes, each dealing with more complexity from the original incident. The emotions drive into and then past the stereotypes of the characters. Denise Cormier is an over-protective mother of a sensitive son. Bill Phillips plays her husband as a beta male, a man who just lost his job in the cut-throat world of finance. In contrast, the Campbells are the power couple. Mia Matthews is the perfect housewife and mother, perfect to the point of obsession. Michael Fredric is her husband, an alpha male who sees anything less that outright injury as boys being boys as they become men. Jolie Curtsinger is the woman in the middle. She is Julia’s sister, but an old friend of Connie. She exists to give us voice and insight into these people who, left to their own devices, would simply bluster and leave. She is the catalyst that moves them past their own viewpoints. It sounds a bit forced, but in practice it is an organic element that greatly benefits After. I don’t want to say too much about the plot because After should be a bit of a surprise for the full effect, even when it feels a bit predictable. But rest assured, the performances are uniformly flawless. Michael Frederic can never drop his alpha demeanor and yet he still brings a depth to the performance that is shocking. And the transformation of Mia Matthews as the perfect housewife is harrowing. By contrast the transformation of Denise Cormier and Bill Phillips seem at first a shorter journey. But the depth they bring to the characters is wonderful. And Jolie Curtsinger never feels anything but critical to the action. I loved After. I was surprised and touched by this show. 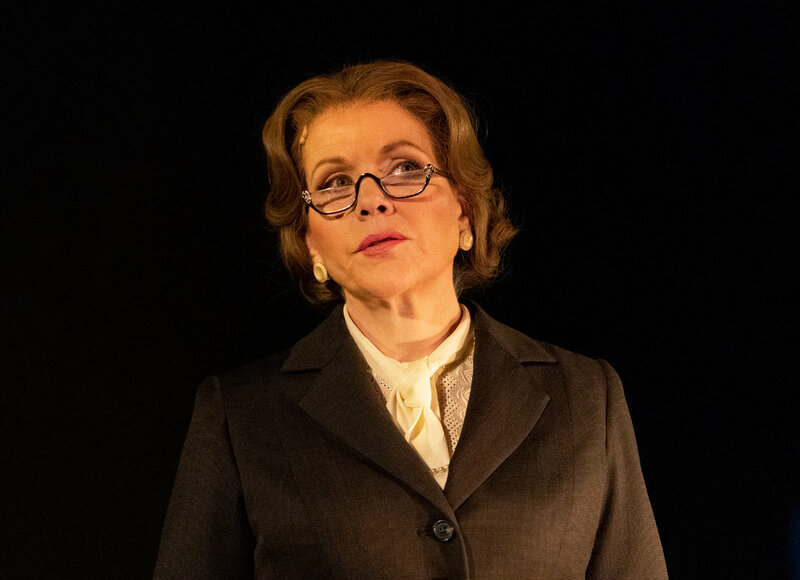 It is a bit of a throwback to peal at the emotions of an upper middleclass privileged family but in using these characters the commonality of emotions is explored. It is wonderfully directed by Joe Brancato allowing his actors freedom to feel, and never letting it feel over the top. Superhero, premiering at the 2nd Stage Theater, with a book by John Logan and music & lyrics by Tom Kitt (composer of Next to Normal) promises a heady ride. And the show starts off fast and interesting, before getting lost. The second half meanders around a bit before just running out of ideas. It is too bad because there is some amazing singing by Kate Baldwin and (one of my personal favorites) Bryce Pinkham. The debut of Kyle McArthur also starts out strong, before winding down. 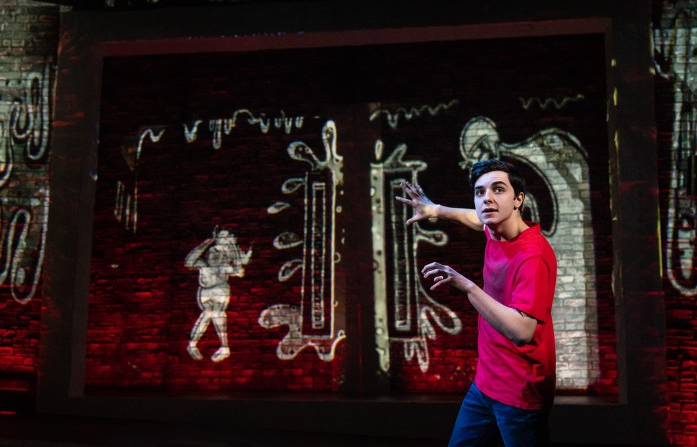 Superhero is the story of a 15 young man – Simon (Kyle McArthur) trying to pull his high school life together after the death of his father and the remoteness of his mother (Kate Baldwin). They have moved to a new city, generic high-rises and problems, where Simon attends school. Whenever he can he draws. He draws superheroes in comic stories that take off on the stage, an interesting idea that is used well early on. Simon sleep-walks through life, looking up only to see the cute environmental activist at school (Salena Qureshi) and his comics. Until ... he happens to see his neighbor flatten a fire hydrant with a single punch. The elusive neighbor, Joe (Bryce Pinkham) might really be a superhero. After Joe gets closer by dating mom and befriending Simon, Joe admits (to Simon only) that he is a real Superhero. Sent from another planet to protect people of earth, when he can. We see Joe use super strength, and we see him bolt out on a beam of light. Is Joe a sad, pathetically lonely man spinning stories to make friends? Is Joe mentally ill? Is Joe really a superhero? Oddly, those questions don’t seem to matter in the story. Joe is ultimately unable to be there for Simon and mom because either, a) the demands on a superhero are constant or, b) he is too emotionally damaged to be physically available. In any event, Joe flakes on being there for Simon and mom. He moves out of the city, and Simon and mom move on with their lives. It isn’t much of a story for over 2 hours of theater. This is surprising because writer John Logan was the Tony winning writer of Red, and the screenwriter of Skyfall, Hugo and a host of other great stories. Superhero could use a rewrite, or use some deep trims. The songs from the wonderful Tom Kitt are not wonderful. Kate Baldwin and Bryce Pinkham lend their amazing voices, but still can’t give most of these songs flight. A fantastic writer and fantastic composer have collaborated to give us a superhero story that is flat and boring. 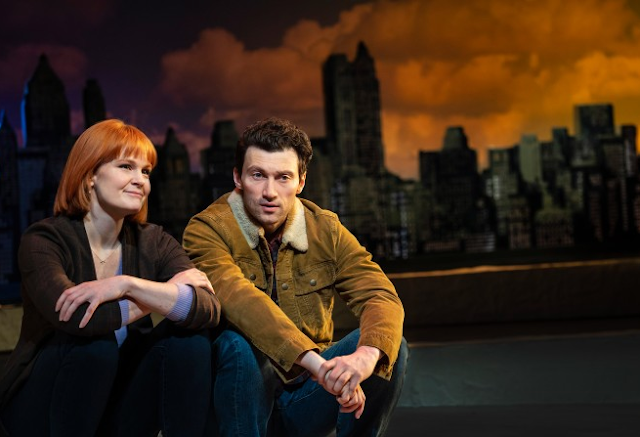 I enjoyed Superhero, because listening to Kate Baldwin and Bryce Pinkham sing live, even not the best songs, is a thrill for me. But I cannot recommend it to others. The rewards are few, and spread out over a too long, too dull play.